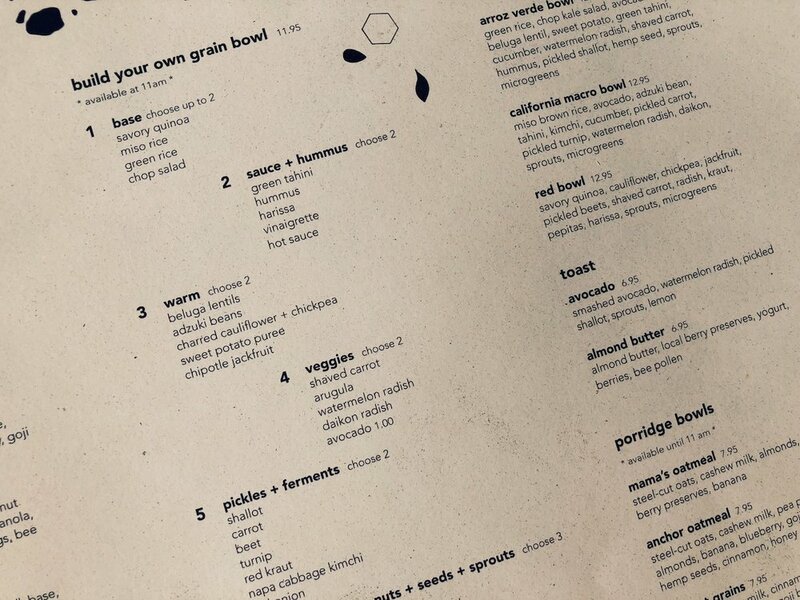 There is plenty of healthy plant based food in LA so I knew it would be a satisfying discovery for each meal coming here, but I was also sure that I'd go back to Backyard Bowls. I discovered it 2 years ago when I was staying for the first time in LA, and I would walk more than 1h back and forth just to go to their place in WeHo!! Haha, yes I like to walk, but I also love their food. Is it an extraordinary culinary experience? Probably not. But it is exactly the way I conceive food: healthy, abundant, plant based and simple but still with lots of flavors. They have several locations and the pictures in this article are from their Santa Monica location which is the area I am staying. Is simple: smoothie bowls (acai, pitaya, green bowls), smoothies, porridge bowls, toasts and grain bowls. That's it. The bases of a plant-based diet. I told you I like to eat a "high carb low fat" kinda diet and I feel like that's what I can easily get without thinking about it too much at Backyard Bowls because the carbs are in the center of everything (and carbs are definitely life). And you have quantity on your plate (actually in your bowl) which is also one of my criteria when I go to a restaurant: how much food will I have on my plate? The other thing I like is that when you eat in, you get a proper bowl, a proper spoon: no plastic and no waste. It's something I was missing when I tried to have acai bowls in New York. Maybe the next improvement would be to also give a proper cup for the water fountain but I know it's not always easy to organize it. Finally, it's fast food: you order at the counter and wait for your food that you can eat in or take away. It's really nice to know that you have healthy and yummy options when you are in a hurry. What Do I personally order? I generally go for a large (yes large, and the portion is huge! 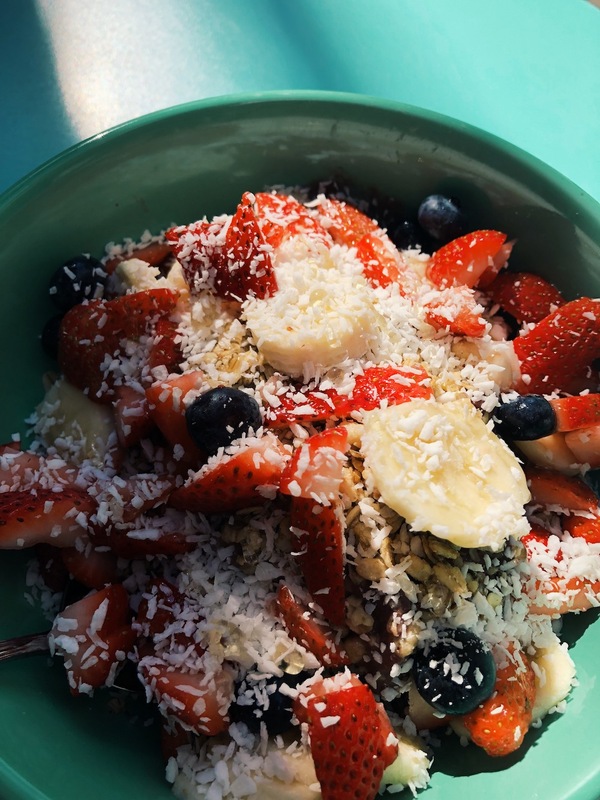 but we know as plant-based eaters that we tend to eat a lot more in quantities, especially on HCLF) Island bowl, which is my favorite of their smoothie bowls: there is mango in it, which is one of my favorite fruits, and coconut milk! It's a simple tropical bowl and I love how they aren't cheap on the granola compared to other places! It's very hot in LA so I love how a smoothie bowl cools me from the inside. I was also very curious to test their grain bowls because macro bowls are really my favourite way to eat, and I am always more attracted to savory meals than sweets. So I built my own: green rice, hummus, hot sauce, cauliflower + chickpeas, sweet potato puree, shaved carrot, avocado, shallots and pickled beets, sprouts, micro greens and toasted almonds. And it was delicious! Like, really delicious! I really felt like I am going to make efforts to cook the same way at home because it is accessible and it is a way to eat that I would like to share. Website. They have many locations so check if there's one close to you! One of my favorite healthy restaurants in NYC is Souen East Village, and if I don't order one of their soups, I always take their macro plate. At first I wasn't really thinking about what "macro" meant except that it was healthy, and that I loved it. But after seeing so many beautiful pictures of "macro bowls" on Instagram I wanted to know more about it. So, what's a macro bowl ? It's simply the name that you put on a perfect balanced meal : a combination of grains, different vegetables (cooked and/or raw), a protein source (that can be tofu, beans, ...), a small source of healthy fats and often you'll add a fermented food to your plate for the health or your digestion. So why do you call it a "macro" bowl ? Simply because with this healthy combination you will get all the macronutrients that your body needs (carbohydrates, proteins and fats). I put together 2 different examples of macro bowls. Preparation time : less than 5mn. Cooking time : 20mn. I steamed the vegetables, boiled the noodles and grilled the tofu in a non stick pan with no added oil. Then I simply put all the ingredients together in a bowl and added the tahini dressing. Very very very simple. I used to say I was a bad cook because I was too lazy to prepare healthy food, and I associated healthy eating with boring or hard to prepare meals. I realize now that it is so much more easy, simple and yummy than I thought ! Here you have the grains from the noodles, the proteins from the tofu (I don't really eat tofu often to be honest, but I love the smoked taste of this one once in a while), and the healthy fats from the dressing. I was wondering if the sauerkraut (which is the fermented ingredient) would taste weird in association with the rest of the bowl, since I always associated it with the super heavy sausage meal, but it goes really well with the smoked tofu ! Preparation time : 10mn. Cooking time : 45mn. I pre-heat the oven at 200°C (390°F). Then I start with the lentil curry because it needs to cook a little while : I put the oil, the ginger and the shallot in a pan and cook it for about 1-2mn. I add all the spices and stir, after that I add the tomatoes. After I stir again a little bit more, I add about 1 cup of water, the broccoli florets and the lentils. I lower the heat and let it cook for a little bit, stiring from time to time. I cook the pumpkin in the oven for about 35-40mn (it's important to check the texture often because the cooking time depends on how thick it is). I sometimes microwave for 3-5mn the pumpkins/sweet potatoes before putting them in the oven to reduce the cooking time by half. I also cook the quinoa and the rice and simply put everything in my bowl, adding the spinach and the avocado. Et voilà ! I also added loads or coriander after the picture ! This is my idea of a perfect dinner simply because it makes me satisfied while nourishing my body with only good things. Some diets recommend to lower your intake of carbohydrates, or even remove them all together, while it's recommended to have your carbohydrates giving you the largest amount of your energy. I believe that instead of cutting out your carbs or any category of food, it's healthier to learn how to eat a balanced diet made from mostly unprocessed foods.